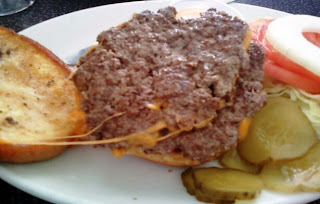 My cholesterol levels were getting dangerously low, and I noticed that Beverly Hills Diner had gotten a little love on some food sites because of the tasty cheeseburgers that they had been reportedly serving up. 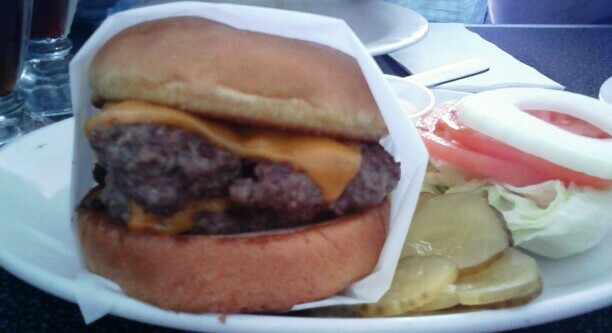 I am often amazed at the seemingly endless number of burger places that there are in LA. Beverly Hills Diner was located at the corner of Beverly Drive and Little Santa Monica Blvd, which put it within a block of Bouchon (awesome), Wolfgang's Steakhouse (sometimes awesome), and The Farm of Beverly Hills (horror on a burnt bun). Beverly Hills Diner was the least fancy (expensive) of the lot--a burger there went for about $8.50--a big, Double Diner Burger--no fries--those were about 3 bucks extra. The Beef: This was a nicely aged, 80:20 Chuck. The beef was funky from the aging and really beefy. This burger really tasted like a burger. It was also as juicy as it could get without receiving an X-rating. This burger, like Nook and The Six, really showcased how good Chuck can be when placed in the right hands. The Sear: This was nearly non-existent. The beef was so moist that as it cooked on the griddle, it exuded so much water that it was steamed in its own juices--as a result, things were just too wet for the Maillard reaction to take place. This was not a deal breaker--the burger meat was good enough without the sear. The Seasoning: They lightly salted the exterior with just the right amount of salt to enhance the savoriness without drawing attention to the seasonings. The Preparation: The loosely formed, medium coarse grind patties (about 5 oz each) were smashed on a hot griddle to a sopping wet Well Done. This treatment was just fine for this beef and was in keeping with expectations of a diner griddled cheeseburger. The Cheese: Meh--this was a mild, yellow Cheddar, which was merely along for the ride. The beef was so flavorful and wet that this particular cheese stood no chance of contributing to the dish in terms of flavor or texture. The cheese did not detract, it simpls added extra calories. The Bun: The bun was a very moist, egg bun. It was just a little yeasty and sweet but bordered on neutral. The bun did a very capable job of keeping fingers dry without intruding on the bite. The Meat to Bun Ratio: It was spot on from the first bite to the last. The Fries: They looked great. My table got the cheese fries, so it was impossible to judge the fries on their own merit--the cheese fries were covered with the same meh cheese that came with the burger, so they were not exciting. The Value--YES! 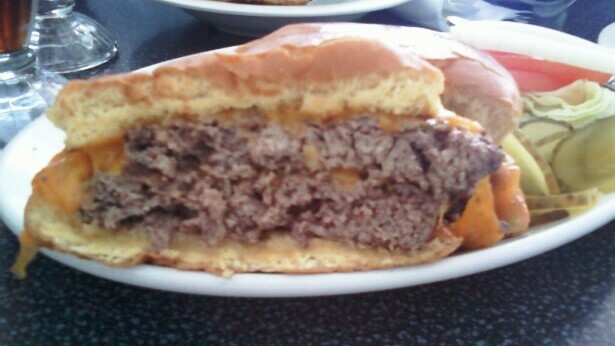 I would have the Double Diner Burger at Beverly Hills Diner again. I think I'll take Happy Meal there--he loves diners. Burger Review : The burger at Beverly Hills Diner was a winner at less than 1/2 the price of the cheeseburger at Bouchon. It was not in the same class as the steakhouse burger at Wolfgang's Steakhouse (on a good day), but it was a darn fine burger, nonetheless.